When you bake for people at work they bring you ingredients. This week, Sara brought me lemons from her garden and vanilla bean from Tahiti. So guess what I made? Preheat the oven to 350F. Line 12-count muffin pan with paper liners. Set aside. Make the cupcakes: Using a handheld or stand mixer fitted with a paddle attachment, beat the butter and sugar together on medium-high speed in a large bowl until creamed. About 2-3 minutes. Scrape down the sides and bottom of the bowl as needed. Add eggs and vanilla. Beat on medium-high speed until everything is combined, about 2 full minutes. Scrape down the sides and bottom of the bowl as needed. Set aside. In a medium bowl, toss together the flour, baking powder, and salt. Slowly add the dry ingredients to the wet ingredients in 3 additions, beating on low speed after each addition. Batter will be thick. Beat in the milk, lemon zest, and lemon juice on low speed until just combined. Do not overmix this batter at any point. Spoon batter evenly into 12 cupcake liners. Bake for about 20 minutes. Check at 18 minutes, then again at 20. A toothpick inserted in the middle will come out clean when done. Remove from the oven and allow to cool completely before frosting. Make the frosting: Beat softened butter on medium speed with an electric or stand mixer. Beat for about 3-4 minutes until smooth and creamy. Add confectioners’ sugar, cream, vanilla extract, and salt with the mixer running. Increase to high speed and beat for 3 minutes. Add more confectioners’ sugar if frosting is too thin or more cream if mixture is too thick. Add more salt if frosting is too sweet. Frost cooled cupcakes. 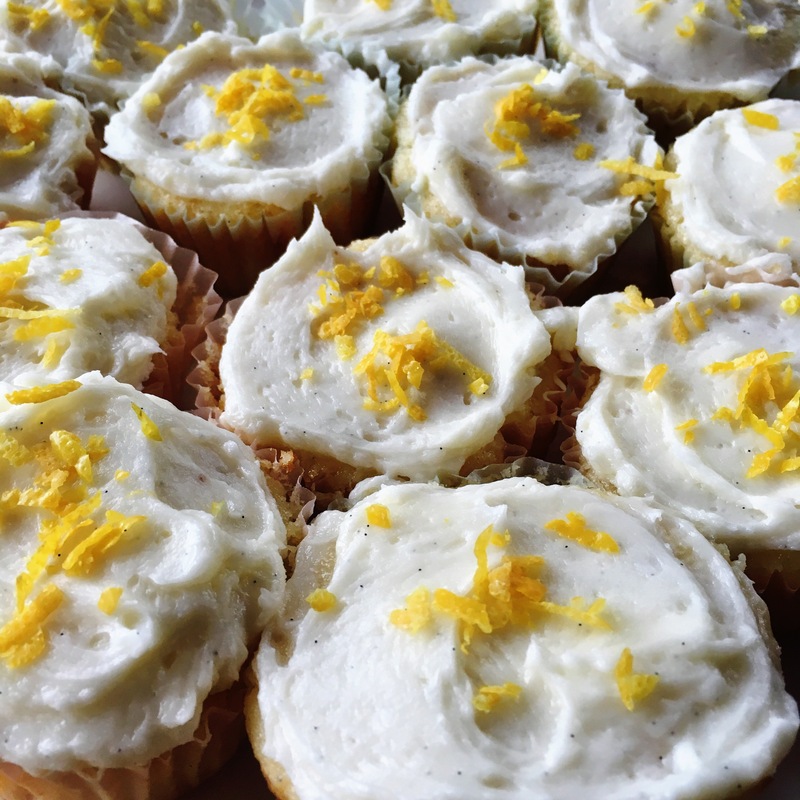 If topping with lemon zest, do so right before serving. There may be leftover frosting depending how much you use on each cupcake.